Which One is Best for You to Buy? With all the dive knives out there, how do you choose the best one for you? 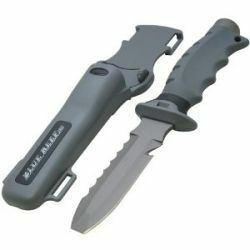 And is a scuba knife really a necessity when it comes to diving accessories? Well, let's tackle the second question first. A dive knife is there to help you if you get caught in fishing line, nets, seaweed, etc. - not to fend off attacks from underwater creatures (although you can always use it if you're in a pinch :)). Think of the type of diving you are doing. If you do any type of technical diving, wreck diving, cave diving, etc. a scuba diving knife (or two) is a necessity. At the other extreme, if you mainly do guided dives in the clear, blue waters of the Caribbean, diving knives probably aren't so much of a necessity. Although it still isn't a bad idea to have one on you. Then there are those types of diving in between. It's a personal decision if you carry a knife, but it's probably best to err on the side of caution and take a dive knife with you. It can't hurt - at least not if you use it and attach it safely! OK, you've decided that you are going to buy a scuba diving knife. How to you choose from among all the options out there? If you consider the type of diving you are doing along with a few basic features of dive knives, you can narrow your choice considerably and make the choice easier. One factor to consider is the shape of the scuba knife. The tip of the blade can either be blunt or pointed. For most recreational divers, blunt tip dive knives should be fine. This way the knife can't be stabbed through anything unintentionally - such as a hose or a wetsuit. A pointed blade is most often used for spearfishing. The next choice is between a straight edge or serrated edge. Again, it depends on what type of diving you are doing but for your basic rec dive, a serrated edge should more than do the job. A serrated edge can cut through tough objects and tends to stay sharper longer. You can also find many dive knives that have both a straight and serrated edge. This is also a good choice that would work in many situations. For your basic open water rec dive, you do not need a monster dive knife. While it may make someone feel like a superhero, it will probably do more harm than good. Remember, you are only carrying a scuba knife in case you get tangled in a net or other object. For most of your dives (hopefully, all of your dives) your dive knife will be staying in your case. Dive knives with about a 4 inch or so blade should be fine. Think of what you may be using the knife for and get the size that would do the job for you. If you opt for a smaller blade, just make sure you can grip the knife securely. Choices in dive knives are usually between stainless steel or titanium. Stainless steel knives typically come in 300 series-400 series alloys. The lower the number, the more rust resistant the knife will be. However, the tradeoff is that the lower the number, the harder it is to keep a hard edge. All stainless steel knives will corrode to some degree, sometimes very quickly, due to their carbon content (which gives them strength). Therefore they will require regular maintenance. After each dive you will need to rinse the scuba knife in fresh water. It is also recommended that you put silicone or oil on the blade after each use. Titanium dive knives are the high end choice since they are significantly more expensive than their stainless steel counterparts. One advantage of a titanium dive knife is that they pretty much require no maintenance. They do not contain carbon so they do not rust. Titanium dive knives also hold an edge well. They may be a bit harder to sharpen, but you shouldn't be using a scuba diving knife often so there shouldn't be much of a need to sharpen the blade. You also need to consider where you will want to attach your dive knife. One common placement used to be on the leg. Probably the most common placement was on the lower leg, opposite the dominant hand. This placement has been criticized as being too easy to catch and/or get entangled in things underwater. A placement gaining in popularity is on the BC. This way the knife is always attached and you won't leave it on the dive boat. A dive knife on the BC may also be easier to reach depending on the situation. If you mount a dive knife on your BC, make sure it has a blunt tip so you don't puncture the BC. You would also most likely want a smaller to medium size scuba knife if you mount it on your BC. If you want a sturdy dive knife, you can't go wrong with this titanium dive knife. It gets the highest rating from many divers and is voted best for comfort, durability and functionality. What more do you need in a dive knife? If that's too much of a knife for you, check out this smaller titanium folding knife. It fits easily into your BC pocket and also receives great reviews. Just remember, for your typical rec dive, dive knives are not to defend yourself against some unknown enemy. They are there to help you out in case of an entanglement. No King Arthur swords here please. No matter what scuba diving knife you choose, please practice sheathing and unsheathing it so you can do it safely. The last thing you want is to cut yourself or puncture your equipment once that knife is out. So think of the type of diving you will be doing, choose the type of features you want from the list above and you should be well on your way to getting the best dive knife for you. For additional information, you might be interested in our page on diving accessories. If you are looking at a different piece of dive gear, you may also want to check out our picks for best scuba gear. Have fun and safe diving.